I'm looking for the 12 o'clock marker which is missing om my 3133 dial. Picture says it all really. A donor dial would also work nicely, though I would prefer not to wreck a pretty dial. The black paint is deteriorating, turns tacky, and is getting to affect the movement itself. I hope there is a repairer somewhere with a NOS example in the bottom drawer! Hi all, Looking for a complete working vostock 2416b movement. Greetings Russian watch fans. I have been trying to make a nice, functioning Amphibia out of an old 2416b movement and a new dial for the best part of a year with only partial success so far. Still need a good plastic spacer ring and a full set of hands. I would like the hands to be the style used on the current scuba dudes if possible. The spacer ring is the most critical item and should be the correct size for the round Amphibia case. Got them now (May 19 2011) Watch assembled and running well. Also same for the rotar and some other Vostok parts. 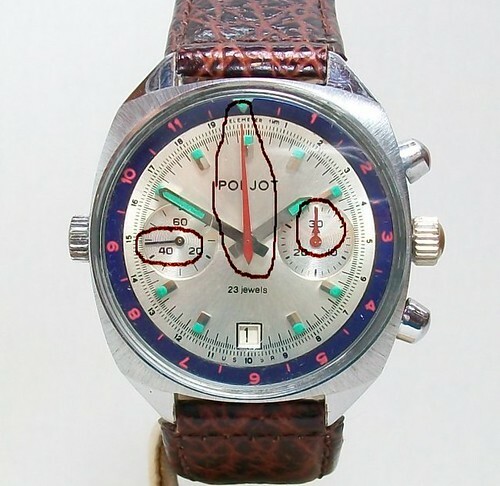 I've got this Raketa with an obviously hand painted dial. Inside is a 2609.HA movement. 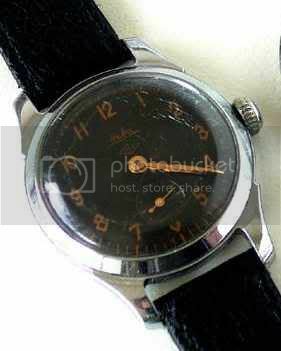 If anyone has an original dial that would fit this watch I would be interested. The "chrono pusher" (as I like to call it) at the 4 o'clock position was missing when I got this watch. My watch repair person found a substitute that does the job, but it is much smaller than the original. Where can I find A MATCHING ONE?